Cononmark have released new indirect mount, 16 sided, deep parabolic softbox modifiers, available now in 90cm and 120cm versions . UPDATE – Bowens and Comet mount versions are now available as well for $368 with shipping. Indirect mount parabolic modifiers are not particularly common in any case, though what really sets the new Cononmark versions apart is the quick release speedring allowing the softbox rods to be quickly snapped open and closed. As well as a unique strobe mounting bracket option which connects to the base of the strobe rather than the accessory mount. The indirect mount parabolic modifier houses the strobe head completely inside, and facing the rear of the softbox. So all light is first bounce of the walls of the softbox before being directed out the front. And its possible then to adjust the position of the strobe head in the parabolic curve, providing a wider or more concentrated light pattern. A key feature of the new Cononmark deep parabolic softboxes is the quick release speedring. Allowing all 16 metal rods to be quickly snapped open and closed, without the often tricky and time consuming task of assembling a 16 sided softbox from individual parts. 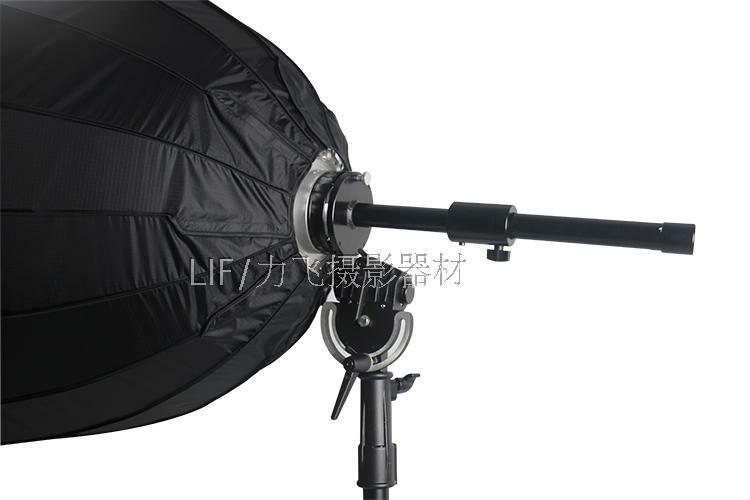 The deep parabolic softbox comes with its own light stand swivel attached. At this stage the Cononmark deep parabolic modifiers are designed primarily to mount directly to Cononmark strobe units, like the recent K4T and I6T EX TTL strobes, using a similar mount to their own removable swivel. Though being a simple L bracket mount design, with some DIY it would likely be possible to mount a regular 5/8″ stud to the L bracket instead, and mount a regular strobe to that stud. This may also require some extension of the L bracket though, to position the particular strobe level with the center of the softbox. The strobe mounting post is also hollow, and provides a opening to thread the the Cononmark battery pack cord neatly through, for external mounting of the battery pack. The Cononmark deep parabolic modifiers provide the option of both internal and external removable diffusion panels, quickly attached with velcro. And in addition to the currently available L bracket mounting versions, Cononmark will also soon be releasing another version of the deep parabolic modifier which mounts the strobe directly via the accessory mount. Again these are designed primarily for the Cononmark strobes at this stage, so they provide a Comet style mount. UPDATE – Bowens mount versions are now available from Cononmark as well. Please see the second image below. And Cononmark also now offer Bowens mount versions. Once the deep parabolic modifier has been quickly collapses down a neat carry bag is also provided for transport. The 90cm (36″) diameter version is 80cm (32″) deep, and weighs between 3.5 and 4.5 kg. The later Bowens or Comet mount version Cononmark deep parabolic modifiers are available now from the Cononmark Ebay store for $368 for the 120cm version (shipping included). The L Bracket version are also available for $281 for the 90cm version, and $349 for the 120cm version (shipping included). this doesn’t look very different from selens 90cm deep octabox . i don’t know why is that expensive . Maybe I missed something on the Selens web page, but all their deep octaboxes I saw use a conventional mount that hangs the flash unit off the back of the modifier. What’s different about the CononMk is the indirect mount, which mounts the flash unit inside the modifier. In theory this should be more efficient, since it lets the flash tube be closer to the focal point of the parabola. It requires extra parts, though, which is probably why it’s more expensive. Yes and the CononMK unit also has the quick release speedring rods which look something similar to the Elinchrom Rotalux speedring design (though with twice as many rods). So you can snap them open without have to assemble the whole thing each time from individual parts. Maybe others may know of some other similar Chinese units though I’m not aware or any. Also the prices will probably be a bit lower if other distributors pick these up. Looking at the price of the strobes I think CononMK are being sure not to undercut dealers with their direct sales. A number of the CononMK strobes are really very compact and lightweight, so this indirect mounting really suits them. And I can see why CononMk would produce these modifiers, highlighting that advantage. Having said that, in most cases I think you would need a counterweight as well. I’m surprised they didn’t put a small hole in the end of the main column post to clip a sandbag etc to. Though it would be easy to drill a hole yourself. Or just use a clamp style weight directly on the column post. Adding the counterweight would balance the unit but would add even more weight to the whole setup. No fun for location work. This is where the remote head on the Godox AD600B should be very handy. Mounting something heavy like the Rovelight is likley going to be problematic even in an ideal location. Why does this image appear to have a different rod setup then the rest? This is more of a Broncolor design where as the rest are like the Selens design. That one has the new strobe mount, so it may possibly be a slightly new softbox design coming as well. I’ll see if I can find out from CononMK. Awesome, looking forward to the update. I ordered one and shipping to Oz was free. Don’t quote me in this, though as far as I understand all the CononMK Paras are the newer looking version with protruding rods now. If your purchasing through CononMK’s Ebay listing international shipping should be included in the price. Obviously that contributes to the extra cost over regular softboxes. EDIT – 16th March 2016 – They have now changed the images on the Bowen’s mount listing to not include any with the protruding rods. So I get the feeling that’s been done for a reason, and we have likely had some miscommunication regarding the protruding rod version. Can anyone explain the advantage of a deep parabolic like this over a parabolic umbrella such as Paul C Buff’s PLM? The (silver) umbrella is cheaper, lighter, and easier to set up, and it has a very focused beam. These look exactly the same ones as the jinbei deep parabolic modifiers except for the indirect mounting arm and speeding Assembly. In fact I had been wondering what to do with one of the thumb screws I found in the modifier bag when I received them. The fourth photo shows exactly where it is meant to go. Thanks elv. For those considering investing in of these, I have the 120 cm version and the snapping of the rods into place requires some muscle. Apart from that they seem to be well made and produce good results. I think you’re right, these do appear to be similar to the direct mount Jinbei versions. CononMk appear to have mainly just streamlined the system to include the indirect mount without additional adapters etc. Though I think they have also updated the softboxes themselves slightly to include the rods tips which protrude past the front face of the softbox (as seen in the images towards the end of the post). Bowens mount versions are also now available. Thanks for the feedback on the rods. The Elinchrom Rotalux rods are very difficult to snap in place as well, unless you sit the softbox on the floor (speedring side down) and bend over into the softbox to push down on the rods and snap them in place. I’m not sure if that would be easy to do that with the CononMK indirect mount in the way though. In the Chinese market have high-quality parabolic softboxes. “Selens” not the best sample. 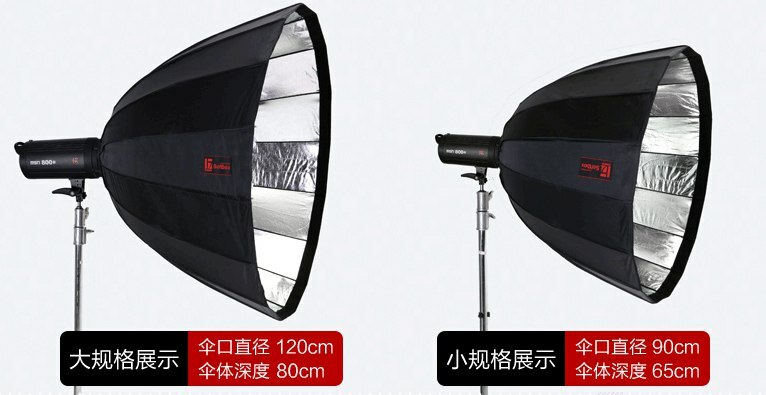 JINBEI offers Deep Parabolic Softbox in two different sizes 90 cm and 120 cm. Do you have a link for “life of foto”? I can find nothing. Thanks. After March 9, I will try to post the link. Sounds good I will wait for your reply. Thanks for all those detail Alexander. The indirect adapter looks like a nice option for adding to various Bowens modifiers. I updated the post as CononMK offer a Bowens mount version as well now. The difference is their indirect mount is built in to the softbox, so its likely a bit more streamlined if you only need indirect mounting. In addition, there is also a similar L-shaped adapter for any monoblocks. Any idea when the item will be released? Hey Mark with Doxie! Once I receive it and do some real testing on talent I’ll be posting my opinion of the modifier on my blog. I ordered the 120cm (47″) version because my ‘travel’ one is my CheetahStand 36″ model which I modified to use with an AD360 and my DIY focusing rod. I may sell my Westcott 47″ Zeppelin if I find this to be as good or better. I currently can only travel via airlines with the 47″ Zep because the 59″ won’t fit in a 54″ case which is the maximum size for airline checked luggage. The Bowens and Comet mount are now available here. Thank you. LOL I notice that link shows “Sold” and I must be the one responsible for that! Mine is due to arrive from the seller sometime after March 16th. They should be listing the Bowens mount versions on Ebay soon. UPDATE – The Bowens and Comet mount 120cm versions are now available from the CononMK Ebay store here for $368 with shipping. I have ordered one of the Bowen’s 120cm versions. Although I have not received it yet I will say that the seller’s communication is excellent. 1. I’d like to use it with an AD360, but where can the battery cord exit the softbox? 2. Are they planning to offer a compatible grid? Ahh, I see the photo with the hollow tube which answers question #1. I’m not sure about the grid, though I’ll see what I can find out. They may need to change the softbox (adding velcro etc) to be able to mount a grid. Has anybody purchased this unit yet? I am curious if there is any way of just getting the focusing device with the speedring. It is a great design and rather light weight in comparison to other devices. What I would be curious about is if there is any way of adding any 16 sided para softbox rods into that speed ring or if it is solid mounted to those rods. If possible where can one get this focusing device? Mine arrived yesterday. Seems well made. They apparently make two models – the one with the little rods sticking out the front and the one without. I ordered the rod version but the one with the flush face arrived. No biggie as they seem to be the exact same thing . Assembly is pretty straight forward. Just bend each rod until the base clicks into place. 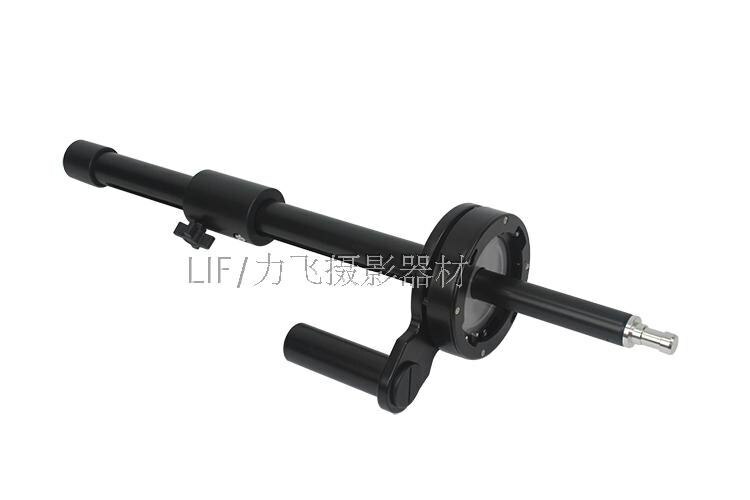 The mechanism that attaches the rod to the lightstand can be positioned either within the unit or behind it. I think I’ll keep it inside as that gives better balance. I have used Bron paras before and this seems like it will do the same thing. I would never buy a Para but at around 1/15th of the price the Cononmark seems worth the purchase. No idea whether you can buy the rod by itself. Although I have seen a very similar rod from Selens. I also just noticed yesterday and (updated my comments above) that CononMK have removed all images with the extended rods from the Ebay listing as well. So other customers have likely commented on that already. When I originally asked about this I don’t think they understood properly what I was asking about. Sam, I don’t think there is any way to use the speedring with a regular softbox and rods. Though you can purchase an indirect mount which has a Bowens or similar type adapter to connect to your existing softbox and speedring, or a speedring version as you were asking for. There is one listed here by Selens which provides both options. Oops I forgot to mention that once Godox releases their separate head for the AD600 I feel that combined with the CononMark will be an outstanding combination. 1] Any different mounts other than ‘Comet’ or ‘Bowens’ ? Perhaps even ‘universal mount’ consisting of a 5/8 stud on an L bracket ? 2] Reference counter weights, are there any plans to offer a counter weight on the focusing rod ? Not a sand bag on a hook but a circular weight the actually fits around the focusing rod ? Suggest that CononMk will limit their market until they can possibly give consideration to solving their mount limitation ! Looks great. Any idea if I can set up a grid on this? Modified the focusing mount to Visatec (Broncolor Small Bayonet mount) to hold a 600W VISATEC Monoblock. Fitted the back end of the focusing rod with a 5kg counterweight for defocused head position. For focused head position added an additional 3.6 kg counterweight on the back end of the focusing rod (as the monoblock flash head is approx 3kg (at the end of a 90cm rod thats some torque on the fitting). Installed this Para on a boom (in the vertical position) with another 5 kg at the base counterweight for stability. A superb addition to our studio !! Do you offer the CONONMK – Indirect Deep Parabolic Softboxes also with a Profoto mount ? I am also looking for one with Profoto mount !!! Please let me know as soon as it’s available. Sorry guys I’m not sure about a Profoto mount for these. When using this how far out are is the strobe from within the box? Im using the Godox AD600 and if I want to use the inner baffle, I have to keep the strobe itself deep in the box, almost all the way in. Is that how you use it or do you not use the inner baffle so theres a greater range of movement and focusing for the strobe itself? Thanks very much for your answer. Furthermore, this PDF by Broncolor entitled ‘ Para focus on 3D ‘ has some very interesting factual information about using para modifiers. Watched the video and read the pdf a few times before experimenting !! The Cononmark 120 para seems to be similar in shape and dimensions to the Broncolor Para 133 not to mention being manufactured from a very similar material ! The difference of course being that the Bron Para range has 24 segments and the Conomark range has 16 segments. Recently, did a ‘ selfie test shot ‘ with the Cononmark 120 para in the ‘ defocussed position ‘ the exposed flash tube on the VISATEC Solo 1600B flash head was almost parallel with the opening of the para. The actual flash unit was out of the para and making a bulge in the diffusers ! Also discovered that when the focusing rod was almost fully extended with a 3kg flash head mounted on it … that a modified total of 13.6 kg in counterweight was required to balance it all out. Also added another 10kg on the lighting stand base to provide further stability just to play it safe ! Only used (x2 equiv) of the outer diffuser (which is approx 1/4 stop per diffuser sheet). Maintained the para to subject distance of 120 cm (which is the para ø) which seems to yield a very 3D light. Its unlikely that I will use the inner baffle in conjunction with the focusing rod. Perhaps if one day the need arises to use the para with direct light and the need to diminish the 3D effect and/or emulate a large octabox then It may get used. Hope that this info is of some use ! Researching flashes and softboxes I came across these modifiers sold under the PixaPro brand. Just thought I’d let you know. They’re available with Bowens, Elinchrom, Hensel, Broncolor, Muliblitz-V and P-type as well as Profoto speedrings. They also have the sliding central pole bracket with a 5/8 stud on the end. Prices seem quite reasonable as well. I found them on this UK site, but they ship internationally. I just completed a studio dance session where the CononMark was my primary key light modifier. I recently used my CononMark 120cm modifier as my key light in a studio dance session. any chance of produce more than size 200 ?